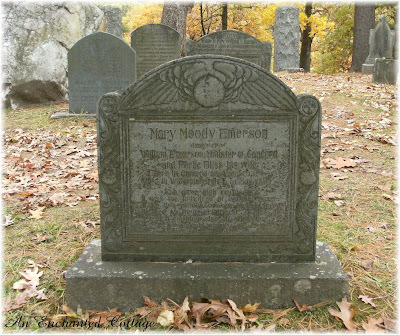 ...in historic Concord, Massachusetts. A perfect place to visit on a crisp October afternoon. 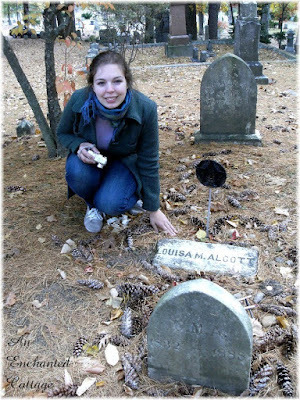 ...where Amanda stopped at Louisa May Alcott's grave. ...but the individual markers are very simple. 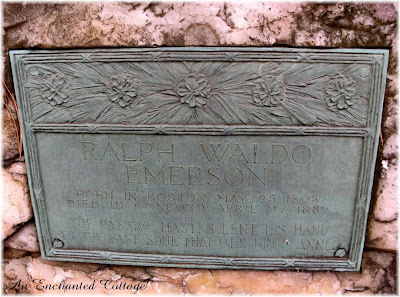 Ralph Waldo Emerson spoke at the dedication ceremony for Sleepy Hollow Cemetery in 1855. 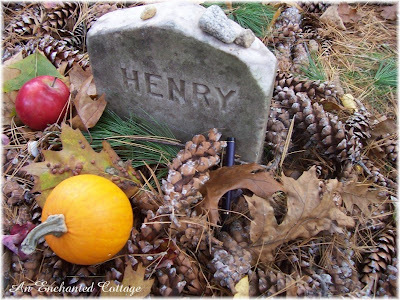 ...where, again, visitors have left gifts for Nathaniel Hawthorne. Around this field, fit garden for our tombs. God's mercy in thy thought and life confest. 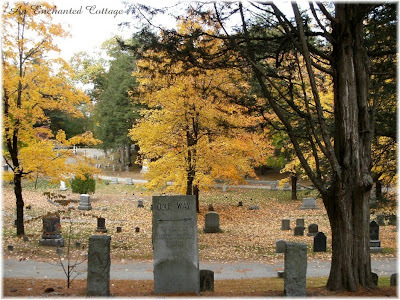 I love Concord and the Sleepy Hollow Cemetery. It just gives me goose bumps to walk where all those people walked before me. Hi Donna! 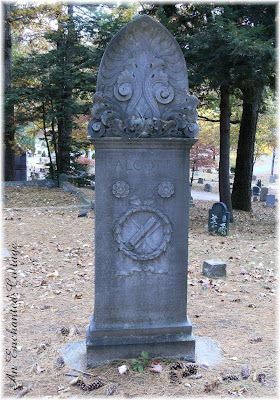 Oh, my, I do love to go through a beautiful cemetery and this is a beautiful one. 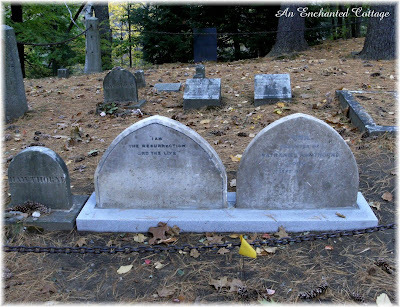 Look at all the famous people buried there! That's just amazing! So many writers. 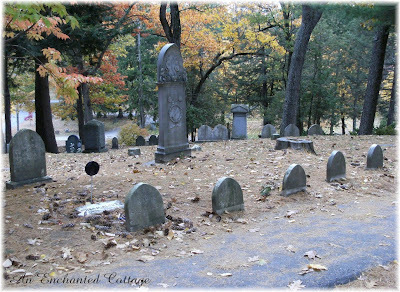 What a wonderful tour of an old cemetery.....I'm just finding others that are also interested in these lovely places. I'm writing myself a note to show your post to my daughter in the morning. 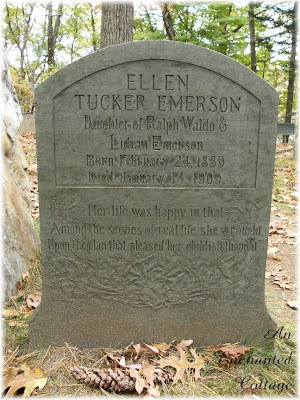 She would love seeing her favorite writers in the great old cememtery. She's 14 and as big a history nut as I am. Great post. Donna, what a wonderful post! 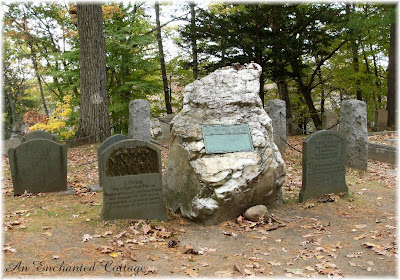 I've been to Concord but somehow never got to the cemetery. I am always amazed that so much writing talent was concentrated in one place. I have to remember to take Don there someday. 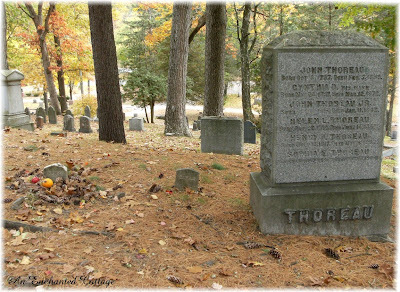 He loves old cemeteries and would be so thrilled to see it. Just love those pics. My favorite story at this time of the year is The Headless Horseman. In fact there is this home in Kenova that displays carved pumpkins, hundreds on them and this year they are going to have a story time with that story on Saturday. Wow, thanks for the tour, what a spooky place I bet that is at night. Great post. You captured it beautifully. 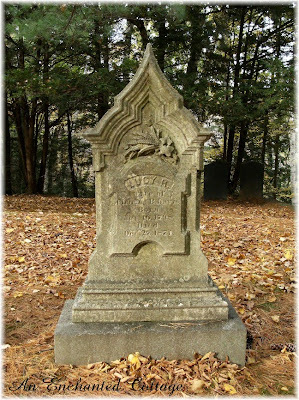 I do love old cemeteries. 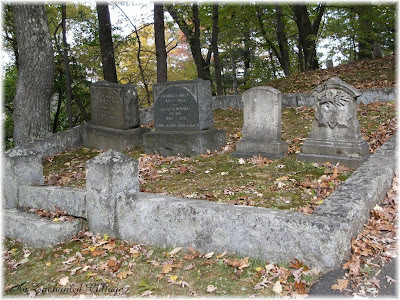 Wow, such famous cemetary plots! I do see the irony. One way in and no way out! 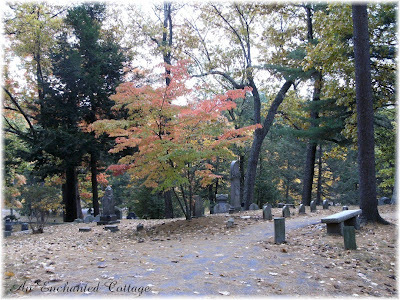 I find cemetaries a tranquil place. Not just for the quiet. There is a sort of peace there however. 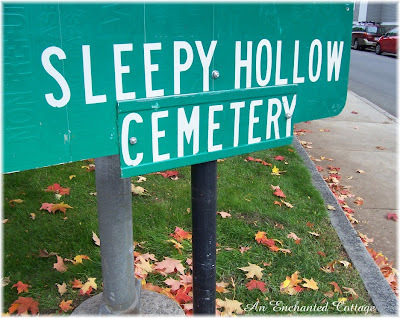 What a great cemetery! I would love to spend some time there. Another reason for me to come visit soon! 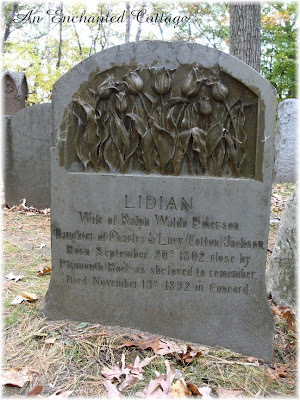 What is it about old headstones that I love? I don't know. History maybe? Mystery? 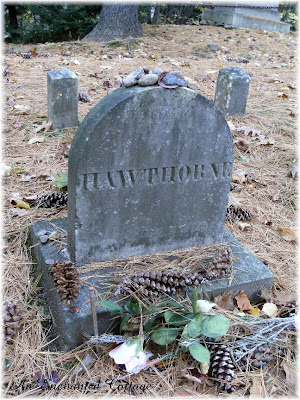 When I see Hawthorne's grave I think of his grandfather who was the judge on the Witch Trials and how Hawthorne didn't want anyone to know he was related to him so he added the W to his name and changed his name from Hathorne to Hawthorne.